Welcome to the Education and Charities Foundation of Houston (ECFOH) scholarships website. ECFOH Scholarships are need based given to qualified students*, residing or who have graduated from High Schools in the Houston Metropolitan Area, who plan to earn a baccalaureate degree from an accredited college or university. Most scholarships are one year, non-renewable unless otherwise indicated in the award description. 3 – Letters of recommendation from current school professor or faculty member or community leader. I understand that if all required information is not submitted by the requested date my application will be considered incomplete and not considered. If chosen as a scholarship winner my picture may be used by ECFOH at their scholarship award banquet and in marketing materials. 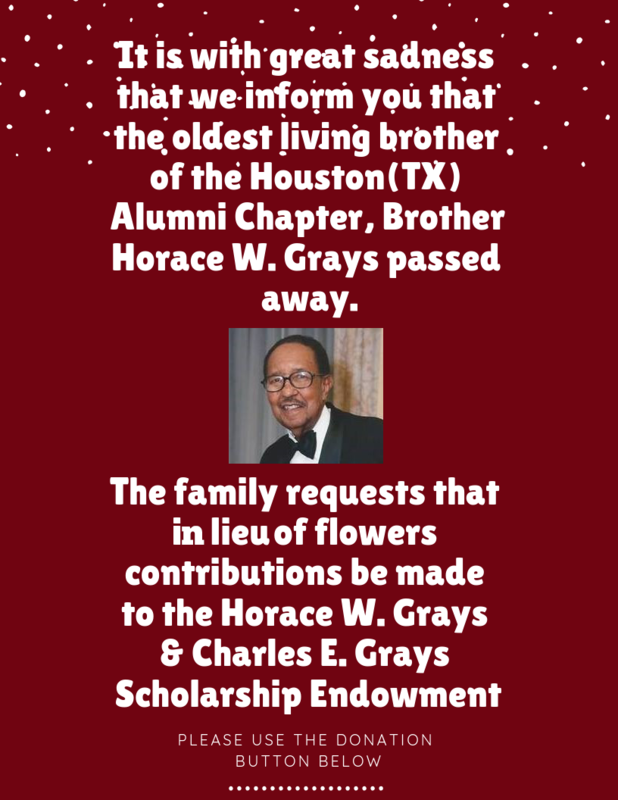 The Horace W. Grays & Charles E. Grays Scholarship Endowment has been established by the Grays Family through Education and Charities Foundation of Houston (ECFOH) to honor the history and legacy of these men; husband, father, uncle and Brothers of Kappa Alpha Psi Fraternity Inc. This scholarship rewards students for their life-long community service commitments; recognizes students who have demonstrated a commitment to community service and promotes their growth as community leaders. This scholarship is open to all Sophomore or Junior undergraduate members, in good standing, of Kappa Alpha Psi Fraternity Inc. enrolled full-time at Texas Southern University, University of Houston, or University of Houston Downtown. Applications will be evaluated for demonstrated academic achievement, significant community service and professional promise, demonstrated record of volunteerism in the community in non-school sponsored activities and participation in extracurricular school activities. Selected scholarship applicant will receive a one-year scholarship of $1,000 for the 2019 – 2020 academic school year. Full award will be disbursed at the beginning of the Fall semester. This is a 4-year award and students receiving this award must maintain a minimum GPA of 3.0 to remain qualified for this award. If the GPA drops below 3.0 recipient has one semester to re-establish eligibility or forfeit all remaining disbursements. Houston (TX) Alumni Chapter of Kappa Alpha Psi Fraternity Inc. The Education and Charities Foundation of Houston (ECFOH) is proud to offer financial assistance to graduating high school seniors and continuing undergraduate students with a financial need attending a 4-year accredited college or University. This scholarship is available to all students with declared or undeclared majors. Selected scholarships applicants will receive a one-year scholarship of$1,000 for the 2018 – 2019 academic school year. Full award will be disbursed at the beginning of the Fall semester. The Education and Charities Foundation of Houston (ECFOH) is proud to offer financial assistance to graduating high school seniors and continuing undergraduate students with a financial need attending a 4-year accredited college or University majoring in a STEM related field. Selected scholarships applicants will receive a one-year scholarship of up to $1,500 for the 2018 – 2019 academic school year. The Education and Charities Foundation of Houston (ECFOH) is proud to offer financial assistance to graduating high school seniors and continuing undergraduate students with a financial need attending a 4-year accredited college or University majoring in Business &Finance related fields. 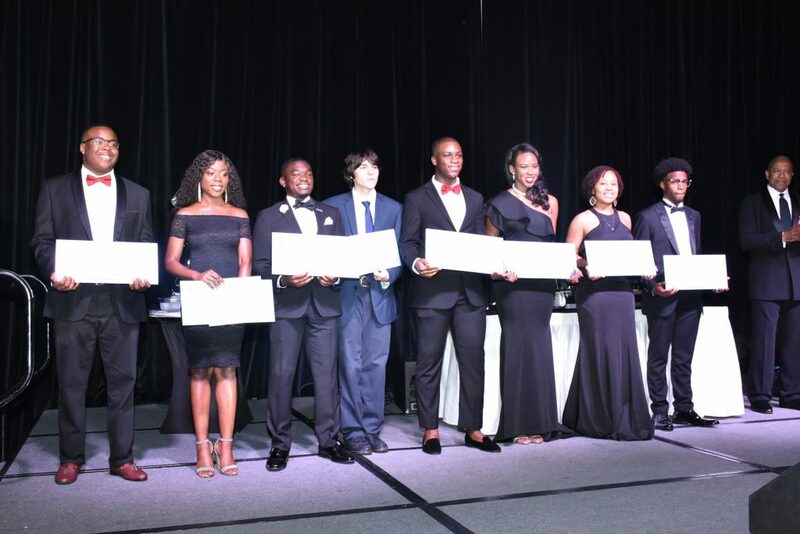 TheEducation and Charities Foundation of Houston (ECFOH), in partnership with the Harris Foundation is proud to offer financial assistance to outstanding students pursuing a degree in Science,Technology, Engineering, or Math related fields. to support education, health and wealth. Dr. Harris holds a Bachelor of Science (BS) in Biology from the University of Houston, a Master of Medical Science (MMS) from theUniversity of Texas Medical Branch at Galveston, a Master ofBusiness Administration (MBA) from the University of Houston ClearLake and a Doctorate of Medicine (MD) from Texas Tech UniversitySchool of Medicine. the “First African American to walk in Space.” A veteran astronaut for over nineteen years, he has logged more than438 hours and traveled over 7.2 million miles in space. Selected scholarship applicants will receive a one-year scholarship of $2500 for the 2018 – 2019 academic school year. Award will be disbursed in the Fall and Spring semesters. The estate of Jack Bradley through The Education and Charities Foundation of Houston (ECFOH) is proud to offer financial assistance to outstanding students pursuing a degree in the fieldof music. Selected scholarships applicants will receive a one-year scholarship of $500 for the 2018 – 2019 academic school year. * Members and the immediate family of members of the Board of Directors of the Education and Charities Foundation of Houston (ECFOH) are not eligible for consideration of any scholarship distributed by the ECFOH. Members, initiates and immediate family of members and initiates of the Houston (TX) Alumni Chapter of Kappa Alpha Psi Fraternity Inc. are not eligible for consideration of the Houston (TX) Alumni Chapter of Kappa Alpha Psi, Fraternity Inc. Scholarship.